A deep look into a single molecule: The quantum state of a magnesium molecular ion has been measured live and in a non-destructive fashion for the first time. A German research group has demonstrated the first implementation of a non-destructive state detection technique for molecular ions. Piet Schmidt and his colleagues from the QUEST-Institute at the Physikalisch-Technische Bundesanstalt (PTB) observed changes in the rotational state of a trapped and indirectly cooled molecular ion in real time and in situ. This technique enables novel spectroscopy methods with applications ranging from chemistry to tests of fundamental physics. The results are published in the current issue of Nature [see literature-note below]. The interaction of thermal energy from the environment with motional degrees of freedom is well known and often referred to as Brownian motion (also thermal motion). But in the case of polar molecules, the internal degrees of freedom - in particular the rotational quantum state - are also influenced by the thermal radiation. So far, the detection of the rotational state was only possible by destroying the molecule. However, a German research group has now demonstrated the first implementation of a non-destructive state detection technique for molecular ions. Piet Schmidt and his colleagues from the QUEST-Institute at the Physikalisch-Technische Bundesanstalt (PTB) observed changes in the rotational state of a trapped and indirectly cooled molecular ion in real time and in situ. This technique enables novel spectroscopy methods with applications ranging from chemistry to tests of fundamental physics. Nowadays atoms can be manipulated with lasers and their spectral features can be investigated with high precision e.g. in optical clocks. In these experiments state detection plays a crucial role: the fluorescence of an atom under illumination with laser light reveals its internal quantum state. Many atoms and most molecules, however, do not fluoresce at all. 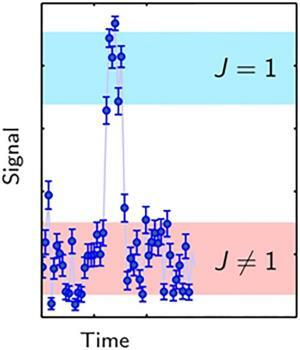 Therefore, one of the standard procedures for state detection in molecules exploited the fact that molecules can be broken apart with laser light of a certain frequency, depending on their quantum state. This lets one measure the quantum state of the molecule by destroying it. Of course this detection procedure can only be applied once per molecule. Project leader Piet Schmidt has a long experience of systems in which state detection is difficult to achieve. He was involved in the development of quantum logic spectroscopy in the research group of Nobel laureate David J. Wineland and extended it with his own research team to photon recoil spectroscopy. All of these novel spectroscopy techniques are based on a common principle: beside the ion under investigation, one traps a second ion of a different species that is controllable and whose fluorescence can be used for state detection. Because of their electrical repulsion, both particles behave as if they were connected by a strong spring, such that their motion is synchronized. This is how the measurement of one particle can reveal properties of the other particle. Schmidt and his colleagues use a molecular MgH+-ion (which is the subject of the investigation) and an atomic Mg+-ion (on which the measurements will be performed). They hold both particles with electric fields in an ion trap. Then, lasers are used to cool the particles&apos; motion to the ground state, where the synchronous motion almost comes to rest. The new trick demonstrated in this experiment relies on an additional laser, whose action is similar to an optical tweezer. It can be used to exert forces on the molecule. "The laser shakes the molecule only if the molecule is in one particular rotational state" explains Fabian Wolf, physicist in Schmidt&apos;s research group "We can detect the effect - which is an excitation of the common motion of the molecule and the atom - on the atomic ion by using additional lasers. If the atom lights up, the molecule was in the state we probed. If it stays dark, the molecule was in some other state." Piet Schmidt highlights two main results of the team&apos;s findings: "Because of the non-destructive nature of our technique, we could observe the molecule jumping from one rotational state to the other. 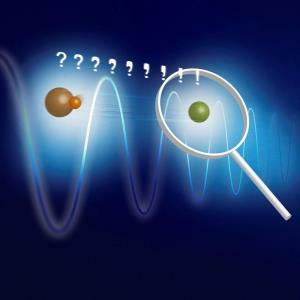 It is the first time such quantum jumps have been observed directly in an isolated molecule. Moreover, we could improve on the uncertainty of a transition frequency to an electronically excited state". He also points towards future goals: "The next step is the systematic preparation of the molecule in that quantum state instead of waiting for the thermal radiation to randomly prepare it." The researchers feel confident that their development will be important for the scientific communities that need precise methods for spectroscopy, e.g. quantum chemistry, where the inner structure of molecules is investigated, or astronomy, where spectra of cold molecules can teach us new things about the origin and the properties of the universe. Furthermore, precision molecular spectroscopy is important for the search for a variation of the fundamental constants and so far hidden properties of fundamental particles, such as the electric dipole moment of the electron. These tests of fundamental physics were Schmidt&apos;s original motivation for working on the novel detection technique. "To make these applications practical, we have to push molecular spectroscopy to a level similar to that of today&apos;s optical clocks based on atoms", says Piet Schmidt, when he gets asked for his long term goal, "For this purpose we have to improve our measurement resolution by orders of magnitude, which for sure will take several years". Non-destructive state detection for quantum logic spectroscopy of molecular ions.